The death squad regime that came to power with US backing in 2009 is in a precarious spot, with Donald Trump moving to deport Honduran refugees and restrict remittances to Central America from relatives living in the United States, and with international criticism and legal actions prompted by the government’s corruption, brutality and bogus “elections.” SOA Watch graphic. From September 10th to 28th, eight people will stand trail for the March 3, 2016 murder of social activist and COPINH co-founder Berta Cáceres. Among the detainees are Major Mariano Diaz Chavez and Lieutenant Douglas Giovanny Bustillo — both were trained at the School of the Americas and received anti-terrorist training in the United States in 2005. 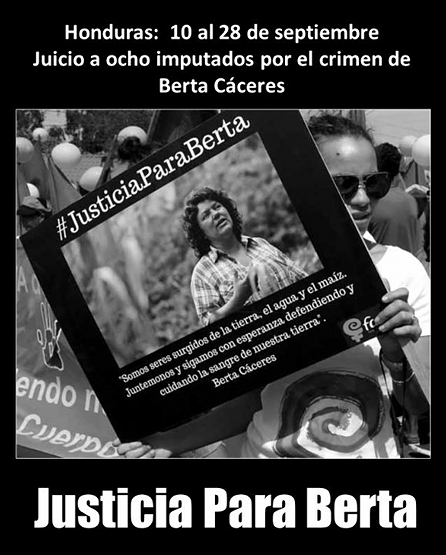 COPINH is calling on the international community to participate as observers in this trial and continues to demand that the intellectual authors of Berta’s assassination be identified and arrested. SOA Watch will be present as international observers during the trail and will have special press coverage.